Wherever Americans stand on holiday-time debates on issues ranging from what’s depicted on Starbucks cups to public displays of religious symbols, it’s hard to disagree that Christmas is still a big part of many people’s lives. 1 Nine-in-ten Americans (90%) — and 95% of Christians — say they celebrate Christmas, according to a new Pew Research Center survey. While these figures have generally held steady in recent years, the role of religion in Christmas celebrations appears to be declining. Today, 46% of Americans say they celebrate Christmas as primarily a religious (rather than cultural) holiday, down from 51% who said this in 2013, with Millennials less likely than other adults to say they celebrate Christmas in a religious way. 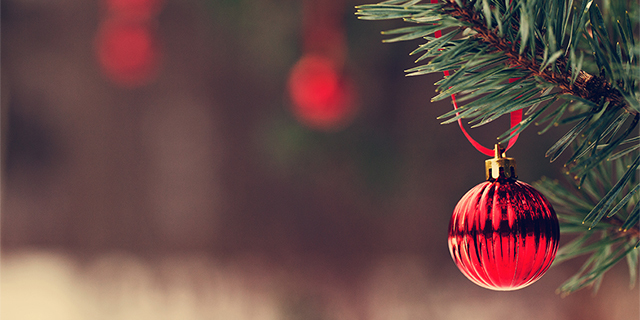 A majority of U.S. adults (56%) also say religious aspects of Christmas are emphasized less in American society today than in the past, though relatively few are bothered by this trend. 3 Holiday displays on government property – which prompt annual scrutiny – are another sometimes controversial aspect of Christmas. 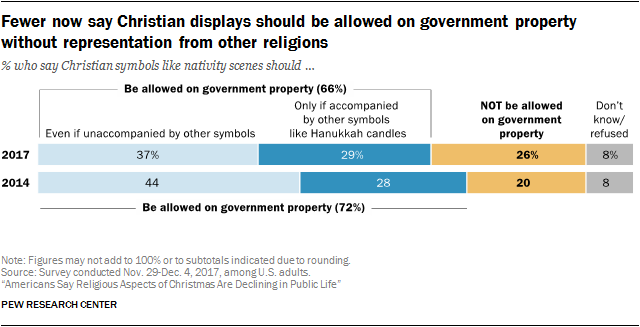 We asked Americans if Christian symbols such as nativity scenes should be allowed on government property, and, if so, whether they should be allowed by themselves or only if accompanied by symbols from other faiths. A growing share says religious displays should not be allowed on government property under any circumstances (26%, up from 20% three years ago). At the same time, a declining share say Christian symbols should be allowed on government property even if they are unaccompanied by symbols from other religions (37% today, down from 44% in 2014). Roughly three-in-ten (29%) say these displays should be allowed only if they are accompanied by other religious symbols like Hanukkah candles, a share that has held relatively steady in recent years. 4 Americans have long argued about whether nativity scenes and other religious holiday displays on public property violate the Establishment Clause of the U.S. Constitution’s First Amendment. In the 1980s, the Supreme Court handed down two landmark rulings that allow for displays of Christmas crèches, Hanukkah menorah and other religious holiday symbols on public property so long as they do not actively endorse or promote a particular religion or religion in general. In practice, religious symbols that are a part of larger secular holiday display (containing, say, Christmas trees, Santa Claus and reindeer) have had a much better chance of surviving a court challenge than those displays that are solely or more overtly religious. 5 Most Americans believe that elements of the biblical Christmas story reflect actual historical events, although the percentage expressing this view has dropped noticeably in recent years. 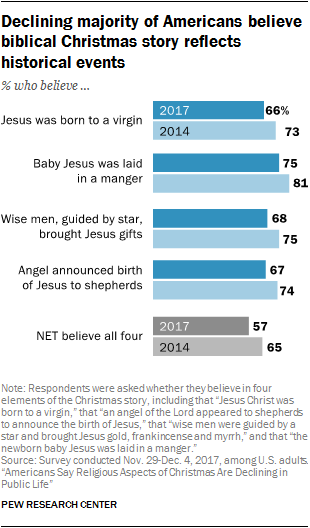 Two-thirds (66%) say Jesus was born to a virgin, compared with 73% who said this in 2014; 75% believe he was laid in a manger, down from 81%. Similarly, the shares who say they believe that wise men, guided by a star, brought Jesus gifts — and that an angel appeared to shepherds to announce the birth of Jesus — also have declined. A slim majority of U.S. adults (57%) believe that all four of these things actually happened, down from 65% three years ago. Belief in these events has declined not only among people with no religious affiliation, but among Christians as well. Overall, about one-in-five Americans (19%) now say none of these things actually happened. Note: This is an update of a post originally published on Dec. 21, 2015.